All of our races registrations begin at $35 and all of them include an amazing finisher’s medal. You see we have heard two things from our runHERs and walkHERs over the years. They want a gorgeous medal to commemorate their race and they want affordable options. Saturday night, June 1st we will have our wildly popular and untimed 5K to kick off the race weekend. Then on Sunday, June 2nd you can participate in a Run Nova Scotia series race that is on an Athletics Canada certified course. All of the races regardless of distance start at $35.00. 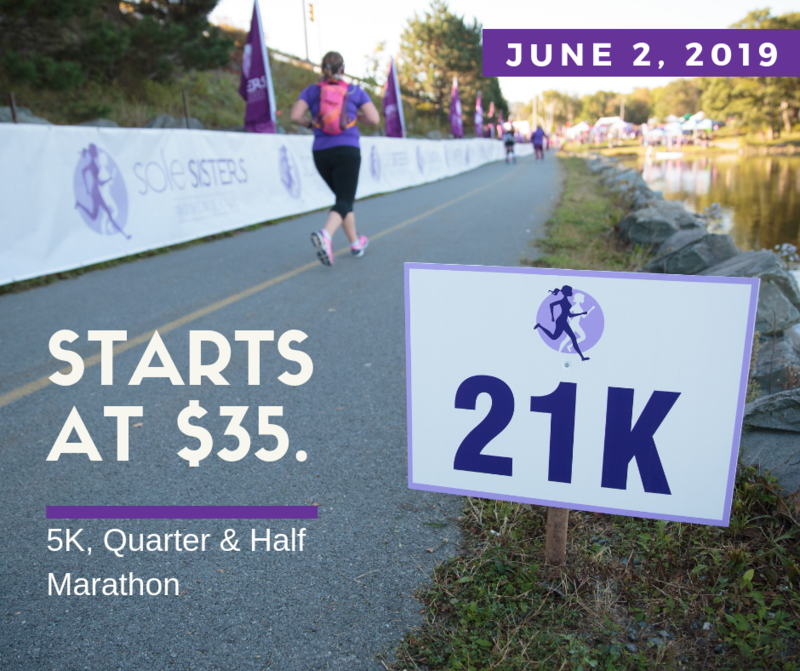 Yep, the 5K, Quarter and Half Marathon registrations all start at $35.00. I am pretty sure you won’t find a more affordable Half Marathon anywhere else; or at least I haven’t and I race a lot! Plus, I guarantee you won’t find another Women’s Quarter & Half Marathon anywhere east of Montreal. So why fly away when you can do it here in Dartmouth?! Thanks to True North Pacing there will be 15 paceHERs on course to help you run all the times we’ve heard matter to our runHERS. Wouldn’t you love to be like our newest Canadian Marathon Record Holder and get your best time at a women’s only event? We always make females the most important part of our Race Weekend. Sole Sisters continues to focus on accessibility, encouragement and amazing race environments, girl you can do this!